Since my visit to Nashville, a few years ago, I was also keen to visit its musical Tennessee twin, Memphis. Finally I managed to do that earlier this year. 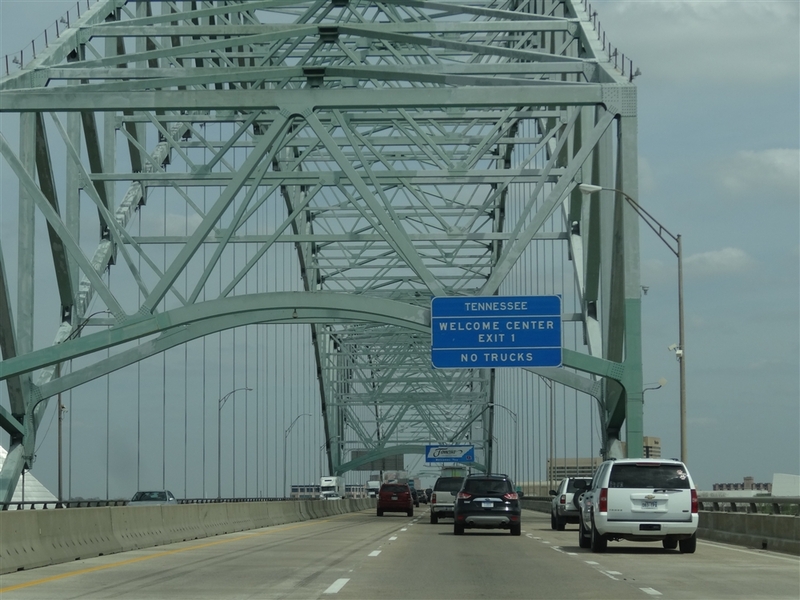 We entered Memphis in the most spectacular fashion by driving from the west and crossing Mississippi on the impressive Hernando de Soto Bridge which offers great views of the downtown. Apart from the grand entry into the city, that route also offers an easy access to the Tennessee State Welcome Center located at the first exit after the bridge. Unusually for that sort of institutions it not only stocks a wealth of maps and brochures but also it is home to a giant statues of Elvis Presley andBB King. Located in walking distance to the downtown (actually right on its edge), it also offers free parking. Well, according to the website you shouldn’t park there for more than 2 hours but the security guard on site told us that it was OK to stay for the most of the day. Although nothing comes free nowadays, it seems that parking sometimes does. So how is Memphis? For a start it is not a very large place. It took us only half a day to explore most of its downtown. We started our perambulations by taking a casual stroll along the pedestrianized Main Street. The only vehicles allowed on this nice, tree-lined, thoroughfare are the vintage streetcars run by Memphis Area Transit Authority. Most of the streetcars are actually restored historic cars from around the world including Porto and Melbourne. 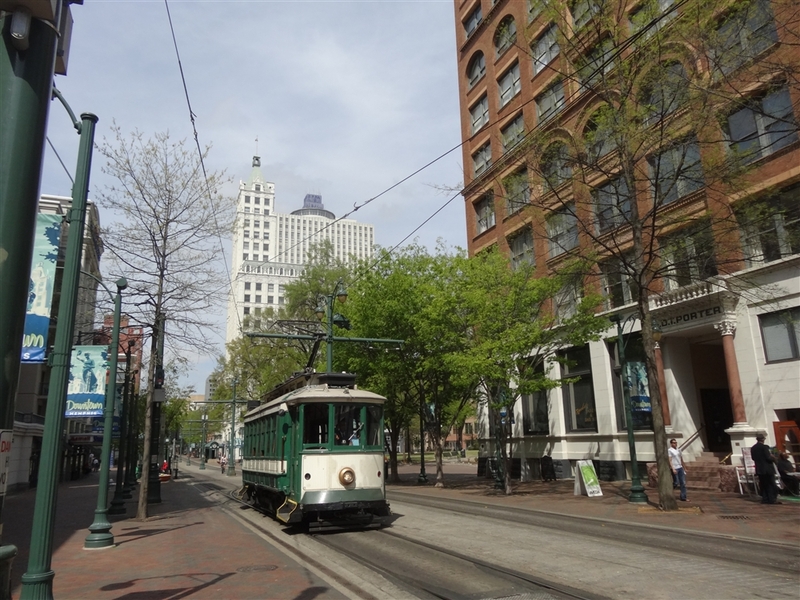 Even if you are not a tram spotter (as I’m not) they are still charming and greatly add to the genteel feel of downtown Memphis. One block west of the Main Street, running parallel between it and the Mississippi River, is another important street, Front. Developed as a cotton trading centre it was in fact the first street of Memphis above the riverfront. By the late 1840s, riverboats loaded with cotton lined the riverbank at Memphis and cotton became a very important item in the economy of the city. For example in 1880 about 75% of all cotton produced in the US found its way to Memphis. Many small cotton companies opened on Front Street, and the vast majority of the buildings on Cotton Row (as the street was nicknamed) were built between 1848 and 1928. They were all brick buildings with wide entrances on the ground floor, so large cotton bales could be moved in and out. They also needed large windows and skylights on the top floors where the classing of cotton took place. You can learn all this and many more interesting facts in the Cotton Museum at the Memphis Cotton Exchange. The exchange started in 1873 but the current building (located at the corner of Union Ave and Front Street) was built in 1924 and its trade floor was used until 1978 when computers took over. It is a small but very informative museum explaining the history of cotton around the world and particularly its importance in the history of the southern states. I wrote all this because personally I like history but I also accept that most people come to Memphis for music rather than history and the musical heart of the city is of course the famous Beale Street. 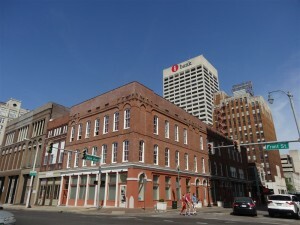 It is here where most of the city’s famous blues bars and clubs are located, especially along the short downtown section of Beale, between second and fourth streets. That’s where all the entertainment establishments create a lively atmosphere with their colourful signs and neons as well as with clientèle spilling onto the street. On Saturday afternoon the street was closed to vehicular traffic and police kept watchful eye on the revellers who were just gearing up for the evening. Music was getting louder and louder, alcohol seemed to flow freely and street performers kept entertaining the crowds. I’m sure the whole place must be hell of a party zone come nightfall. However fun it might be we decided not to hang around. First, we didn’t have any accommodation booked near the Beale, and second, I’m not really a blues fan as I would rather prefer country or rock music (that’s why I really enjoyed a night out in Nashville, a few years back). So, from Beale Street Historic District we headed south along the Main St. This part of town is slowly gentrifying but it is still quite run down in places. We spotted a few nice coffee shops, restaurants and bars along the Main and in one of them (the name of which I don’t remember) we had a delicious snack the details of which I can’t exactly remember either. I only know that it was some sort of salad containing pecan nuts and avocado. Whatever it was, it was bloody delicious. 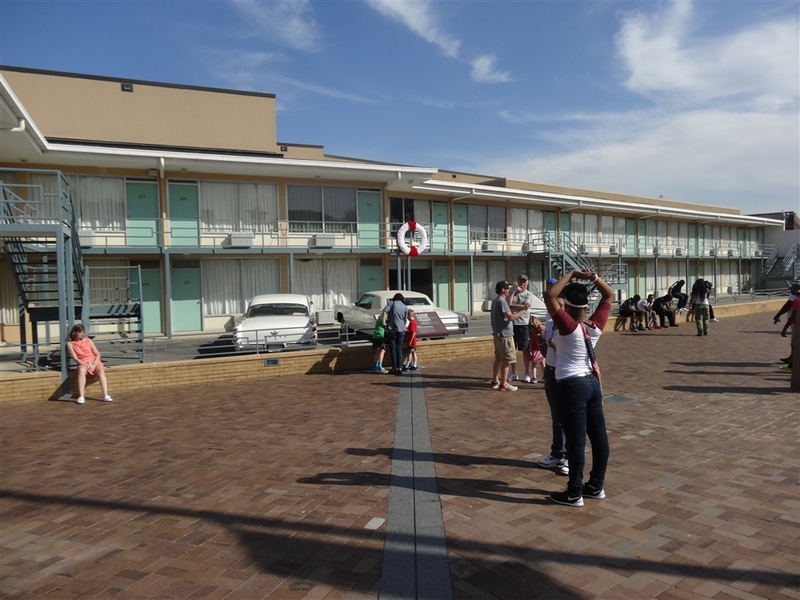 The southernmost point of our walk across Memphis was the famous Lorraine Motel where on April 4 1968 Martin Luther King Jr. was assassinated. 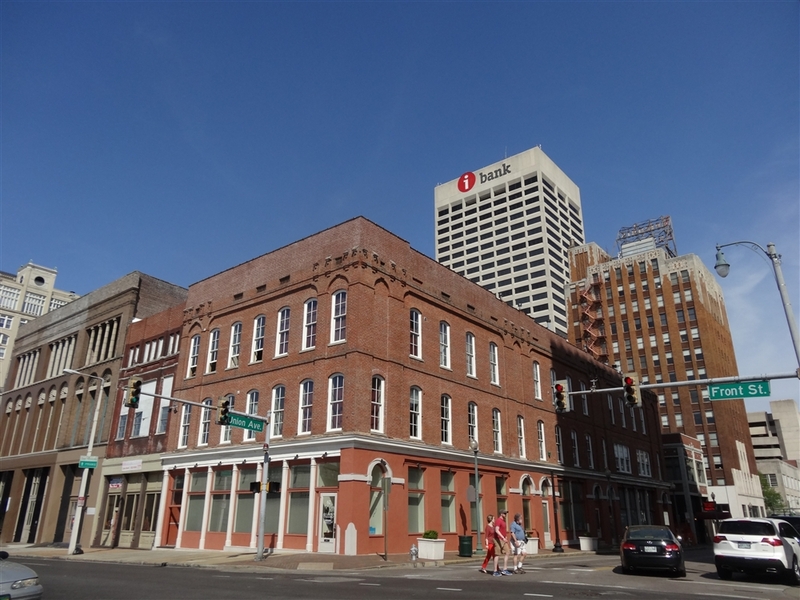 It is now a privately owned National Civil Rights Museum which preserves Room 306 where King was staying and the balcony in front of it, where he was shot. They also preserve the building on the other side of the street where the shots were fired from. The street between the building and the motel was converted into a public plaza with the line of fire clearly marked on the pavement. We didn’t enter the museum as it was about to close, besides we weren’t really in the mood to dig into the complicated history of Civil Rights Movement. So we decided to slowly walk back to our car, admiring the architecture of Memphis and taking lots of photographs. Of course there is one more thing we have to mention when we speak about Memphis, the King. I mean the other King. Yes, Elvis Presley. Now, let me make it absolutely crystal clear, I’m not a fan of his at all. More, I actually really don’t like his music (I have the same problem with the Beatles), but being in Memphis and not even taking a peek at Graceland is like going to Rome and not seeing the Vatican. So, we decided to go and have a look. To get there we had to drive as Graceland is located 9 miles south of downtown Memphis in Whitehaven community (less than 6 miles from the Mississippi border). Unfortunately we didn’t have a proper map of Memphis so we got lost trying to navigate the south side of the city in a search of the freeway. That way we ended up in some less than desirable neighbourhoods. It wasn’t some dramatic ghetto but… let’s just say that I wouldn’t like to end up there at night, or without a car. Finally we found our way to Interstate 240 and eventually got to Graceland. 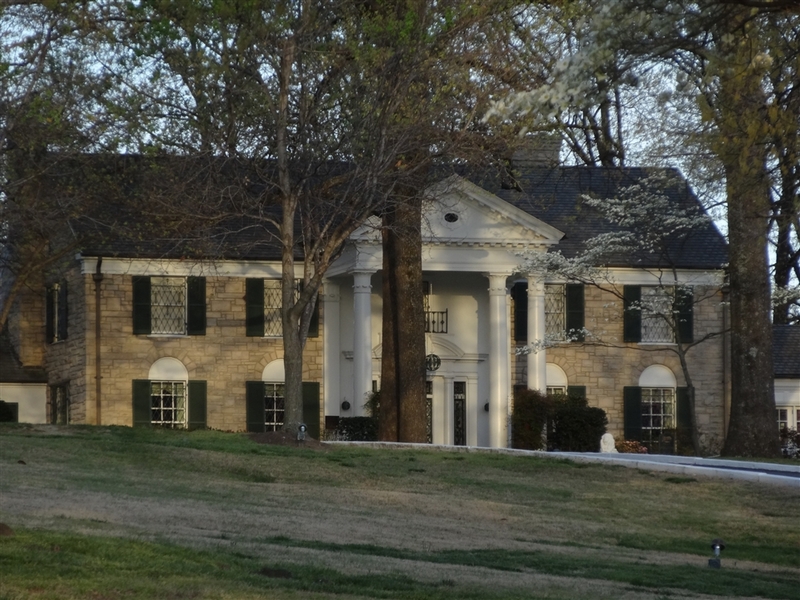 It is a large mansion which was home to Elvis. Believe it or not but in 2006 it was actually designated as a National Historic Landmark. I’m kidding you not. Nowadays it is of course a hugely popular museum. After leaving their cars on one of the vast parking lots across the street visitors have to pay a fortune and endure long queues to be driven in ridiculous trolleys to the mansion itself. I was really glad that we were there way past the closing time with most of the crowds gone. So we stopped briefly on the side of the road and had a quick peek over the fence. If you ask me it is just yet another house but the fence itself was quite interesting because fans (or believers, as the cult of Elvis reminds me sometimes of yet another religion) leave their dedications on it. Some of them are quite funny like the one where some Dane proclaims that Elvis is still alive and lives happily in Copenhagen. We really had a fun day in Memphis. It might not be a very large place but there is enough sites to keep you busy for a day or two. 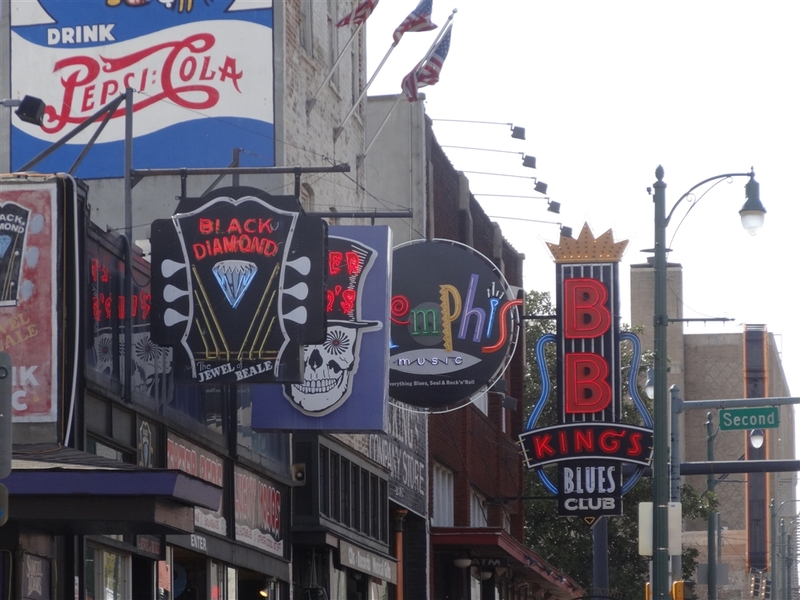 And if you are into blues music you should definitely spend a few nights in Memphis hopping between many of its bars. Even if I’m not a huge blues fan I wouldn’t mind experiencing the Memphis nightlife myself. 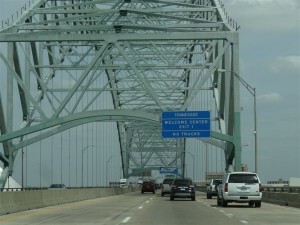 But in our case we were heading south towards New Orleans and its drag was strong enough to shorten our stay in Memphis. So, after leaving Graceland we drove south and in a few minutes entered Mississippi. That’s where the real Deep South begins. But more about it next time. This entry was posted in Uncategorized and tagged Beale Street, Cotton Row, Elvis, Graceland, Lorraine Motel, Memphis, Memphis Cotton Exchange, National Civil Rights Museum on August 25, 2014 by admin. I personally didn’t like Memphis, Beale st is nice and characteristic, live music is fantastic but you can see there’s a lot of police around. On Graceland, I spent 42 USD and they were very well spent. I was a just mild fan and trust me, the KING was a real legend. The attraction itself is very well made. Nashville is great, live music at every corner at anytime. A lot more safe too.